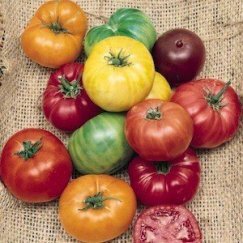 What to do with my container garden in winter? I'm renting (in zone 7, Alexandria VA), so I've placed a lot of perennials in pots. What do I do with them this winter? I've heard a lot of things- bury them, wrap them, mulch, don't water once the ground is frozen, place in a sheltered unheated area- but I guess my concern is with light. How much light should the container plants receive in winter? 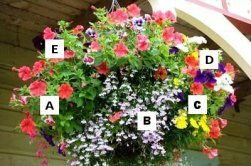 I've read that an outdoor container plant should be hardy to a zone - 2 zones from where you live. But I've also read about the freeze/thaw cycles that container plants can go through. Even if a plant is fine with the colder temperatures it will experience in a pot, won't constant freezing and then thawing from the sun still rot the roots? Does this mean that the plant needs to be kept completely out of the sun until spring? These are great questions and certainly will be a great help to our readers. First, I'll say this: You can't just leave the perennial container outside for the winter. 99% of the time, they won't make it. The roots don't have enough protection from the freezing like they would if they were planted in the ground. when you dig them up and return them to their pots....I guess if you go 3 or 4 weeks without snow or rain, you could water them some. Your next option is like you stated above, bury them in their pots. It's a great idea...as long as you have space to do so. The same watering as above applies here. The neat thing about doing it this way, is in the Spring, you dig them up and they are literally ready to go. No transplanting, etc. I'll insert this...no matter what you do, you can't leave terra cotta, etc. pots outside. They crack to easily with the freezing and thawing. You'll need to bury them in plastic pots. Next thing you could do, again as you mentioned above, is to keep them in a garage, etc. It would need to be around 40 degrees or so. 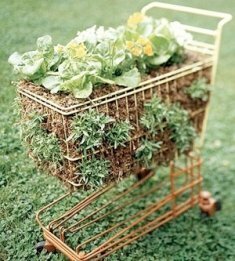 They'll be dormant, so light won't be an issue. What ever light is in the room or not in the room, will be just fine. Water them the day you put them in the garage, and don't water again until you bring them outside for Spring. As far as light requirements outside, don't be concerned about how much they get. If you plant them or bury them in their pots, their light requirements will then be the same as any other perennial you would have planted in the ground in your garden. Please let me know if I answered your question well enough or not! Comments for What to do with my container garden in winter? As always Brad gives excellent advice here for your containers and their survival. I also am a huge container gardener fan and have found these tricks have worked for me in zone 6 Philadelphia, PA, Center City where we have no ground to bury our clay pots into any dirt. My backyard is a concrete jungle, and as so, I do these following tricks to save as many perennials even annuals over to next year. One trick is, if any are in clay or ceramnic pots transfer to large plastic,or even sytraform containers. I have found the use of "DEER PARK" 5 gallon empty containers work great. They give away cracked or unusable, so free containers.Just cut off at top so you can put your dorminate plants in them, wrapped with bubble wrap, for expensive heavy ones, or my favorite FREE again, is use of free pine needles. Great for bedding never leave container on ground get FREE skids from any store and collect all containers together wrap together in bubble wrap cover entire area with bags of pine needles. 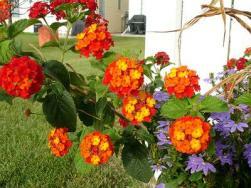 As for those annuals, even they grow back in our frigid weather with proper autumn care. Sweet potatoes vines are cut back, take actual potatoes wrap in shredded paper from your own shredder and nest in a open air box. They grow back fuller and bigger every year. 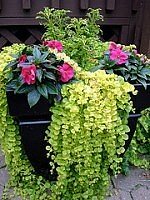 Most all creepers are the same and can be kept alive for your next years containers of thrillers, fillers and spillers. I also save my begonias, Dahlia,and geraniums, dusty millers, even pansies. As for plants I have not yet officially grown for myself this is the time of year I run around looking for samples of perennials I might like. I take with permission, clippings from plants I admire and never leave home without a jar of honey. Why, because as soon as I cut the twig I dip the newly cut end into the honey, as sealant of sugar to promote healthy transference when I soak it or just plant it.Strange but true. I also use my husbands used Lava rocks for the bottoms of my exotic banana plants and certain pacific ferns. Also at this time of year I increase my phosphors, and potassium to my nutrient water and decrease or eliminate all nitrogen. If nature provides it I use it, and reuse it. I hope some of my silly but effective tricks provide you with many unexpected treats come spring time. And again thank you Brad for all your help.
" IT'S MY NATURE TO NURTURE"
Thank you! That was the most complete answer I've ever gotten!